Method: Non Alcoholic. 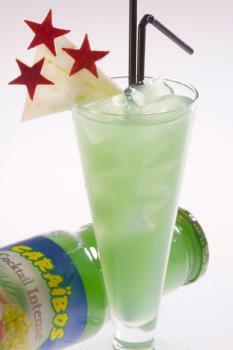 Combine 2 1/2oz ALOE JUICE CARAIBOS, 1/2oz fresh lime juice and 1oz apple puree FUNKIN into a into tin with ice. Shake and pour into a tall glass. Garnish: Inscrute stars made from red apple skin into a triangle made of green apple (granny smith). Method: Combine 1oz BOMBAY SAPPHIRE Gin, 1/4oz Lemon Bergamote juice (from marocco) and 1 1/2oz CARAIBOS Black Berry Colada juice into a shaker tin with ice. 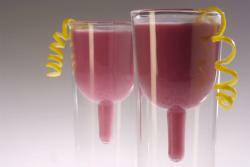 Shake and strain into a funky glass. and 1/2oz Fresh Lime juice into a shaker tin with ice. Shake and strain into a tall glass full of crushed ice. Float 1oz Captain Morgan Spiced Rum on top. 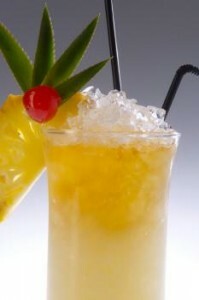 Garnish: A slice of pineapple, 3 leaves of pineapple and a cherry.